Considered Flying Overseas for Your “Dental Holiday”, Have You Thought of the Risks? How far would you travel to visit the dentist? Many people even consider flying overseas, going to countries such as Thailand and Malaysia and thinking it may be a cheaper option. Some medical tourism agencies try to capitalise on this growing trend. Though it may seem like a great idea to pair up a tropical holiday with some dental treatment, you need to be aware of the risks. The Australian Dental Association (ADA) has written a fact sheet warning dental practitioners and patients, who may considering this increasing trend, of the potential risks involved of dental work overseas. This fact sheet covers emergencies through to the experience levels of overseas dentists. As a generalisation, patients who seek this kind of treatment often require complex treatments to be performed, and the more the complex treatment, the more risk there is of complications. Even in Australia, when receiving treatments and procedures, some risks are involved. However, the ADA has stated that Australian dentists are trained to deal with dental emergencies. If something were to go wrong, you would want to feel safe, assured and comfortable that your dentist has the correct training and experience to deal with any and every possible complication. Materials – Are They Top Quality? All Australian dental materials are regulated by the Therapeutic Goods Administration (TGA). This ensures the utmost top quality of every material used in all treatments Australia wide. There are no guarantees that dental crowns, bridges or implants you receive overseas will be regulated at all, let alone to the Australian standard. Any faults or damages to any fixtures will need to be corrected, which may end up being requiring even more extensive treatment. How Sure Are You of Their Qualification(s)? Unlike Australia, not all countries have the same standards of quality and experience for their dentists. We undergo years of study at university and must be registered to practice in their state of practice. They must also continue to take mandatory training to ensure they are up to date with the latest techniques and technologies. 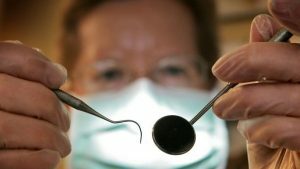 Just because an overseas dentist claims they are qualified, does not automatically mean they are to the same standard as those in Australia. Similarly, the way that qualifications cannot be compared from country to country, infection control standards cannot be compared either. While health professionals, dentists included, adhere to rigorous protocols to stop the spread of disease and infection, there are no guarantees that other countries will do the same. If however, in the unfortunate case of infection, you will want to be in the care of qualified Australian practitioners. Don’t risk your oral health to overseas dentists who haven’t been trained to Australian standards, your oral health is important! 7 Pearls Dental offers a wide variety of dental treatments from our modern and safe practice. If you would like to find out more about the risks involved in overseas dental holidays, or need to have an overseas issue tended to, call the friendly team at 7 Pearls Dental today.